Home » Evangelistic Improvisation » Introduction To Runs And Fills » What Notes Do I Play? » If it is in the chord, it works. This is the simplest rule, yet will meet most of your fill-in needs. To use this rule, however, you must be familiar with all the different types of chords, found in the chord tutorial. Let’s begin by looking at the old missionary standard, Send The Light. 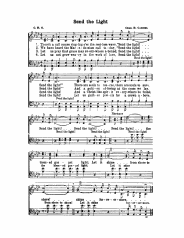 If you wish, you may print out the sample provided below, or you may reference your own hymn book. 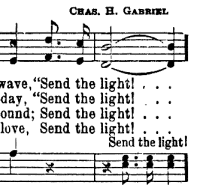 Send The Light has many places where different runs and fills can be added. One of the most obvious places to add a fill is during any of the multiple beat notes. 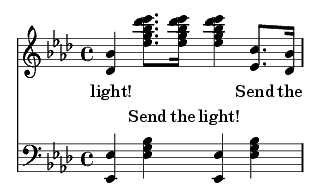 Consider the third measure, in which the word “light” is held for three beats. You could just play three beats of the octave and chord, or you can use what you know about chords to add notes in the right hand. 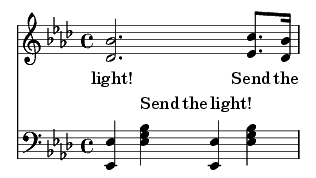 The underlying chord for this measure is the Eb7 chord. (If you are unfamiliar with how to analyze which chord should be played during a particular measure, please read our section on chords.) One thing that most people forget is that the Eb7 chord (as with any chord) is repeated over and over on the keyboard. Therefore, to fill in this “dead space” you can play an Eb7 chord anywhere on the piano. For this example, play a full Eb (or Eb7, if you like) an octave higher as a block chord (playing all the notes simultaneously), using the rhythm which appears in the alto, tenor, and bass lines. Remember to keep the O/C steady in your left hand! 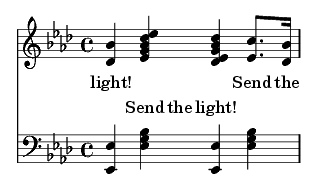 Now look at the fourth measure, which also holds out the word “light” for three beats, this time on an Ab chord. You could use the same technique as you did in the preceding measure, but you are trying to learn variety, right? This time, will play an Ab chord an octave higher, but instead of playing it as a block chord, arpeggiate it in triplets, as in the example. Just as before, keep your left hand steadily dictating the beat. 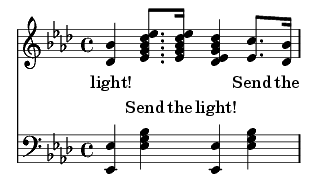 Now look at the seventh measure, which is also the word “light” held for three beats. Again you are faced with an Eb7 chord. In this case, play two inversions of the chord moving down the keyboard, as you can see in the example. This is a particularly well fitting addition, for it sets up the continuing downward motion of the following measure. For added effect, you could also mimic the rhythm of the alto, tenor, and bass. In the right hand, we will play inversions of the Ab chord ascending, as seen in the example. 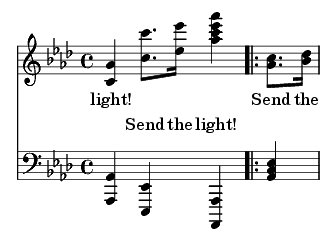 In this option, notice that some of the notes played in octaves in the right hand in octaves have no chord tones. This is because the notes are moving so quickly that the passage sounds muddy or cluttered if you try to play the entire chord every time. This technique is called "outlining the chord". 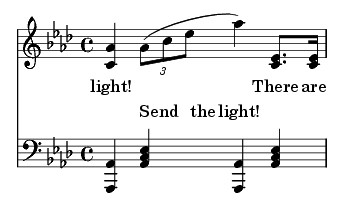 The contrary motion (two hands moving in opposite directions) in this particular fill-in serves to broaden the sound and give a full conclusion to the musical thought. 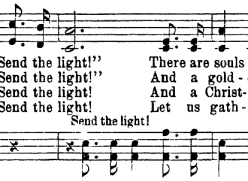 Since it gives a feeling of finality to the phrase, this fill-in is a common ending for verses and choruses alike, when playing in the congregational style. I hope that you are seeing how you can use simple chords to fill the holes in music, but I must warn you: The natural tendency is for you to think “Wow, this is great! I’m going to read all the other sections right now!” While I hope you are this enthusiastic, I am afraid that you will then be overwhelmed with all the new information, and while trying to put it all into practice, become bogged down by it instead. Rather, I encourage you to master the information in this section, and then move on to greater things. Please take the time to follow the steps given below, and enjoy the new skills you are developing! In all, you have just seen four fills to be used in this song. The chorus contains six more fill-in opportunities very similar to the four just discussed. Identify them, and improvise a fill-in based on the four previously studied. Always perfect each fill-in you use. A well executed fill enhances the song. A sloppily executed fill makes you sound amateurish. In order to master each fill, play the entire song, using only that fill. 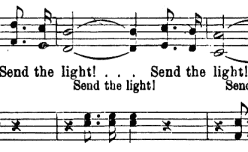 In other words, when playing Send The Light, play the first pattern at each of the ten fill-in opportunities throughout the song. 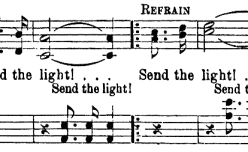 The second time through, you should play the second pattern at each of the ten fill-in opportunities throughout the song. Repeat this until you have utilized all four patterns. Repeat any patterns that are giving you trouble. You may notice that when you use the same pattern repeatedly in a song, that your ear begins to anticipate hearing that particular pattern at the next opportunity. This is good when you are practicing, because it helps you to hear and play the fills in the right place, but it is bad in performance, because it means that you are using that particular pattern too often. Now play through the song using a different fill at each opportunity. The second time through, you should play a different fill from the time before. Make it your goal to never play a song the same way two times in a row, lest you fall into a rut, and your playing grows common and stale. There are 1,048,576 ways to play this song, using only the four fill-ins provided in the ten different opportunities in this song, and there are 78,732 ways to play this song if you never repeat the same fill twice in a row! Obviously, some ways will sound better than others, but I do believe the point is clear: Never play a song the same way twice! Find other songs of like style (ex. There Is Power In The Blood, Kneel At The Cross, He Keeps Me Singing, Take The Name Of Jesus With You, etc.) and apply these four patterns to their fill-in opportunities. Experiment. There are many other ways to use chords as fills, but it is up to you to find the ones that best compliment your particular style of playing.